Today I have a real treat for you! 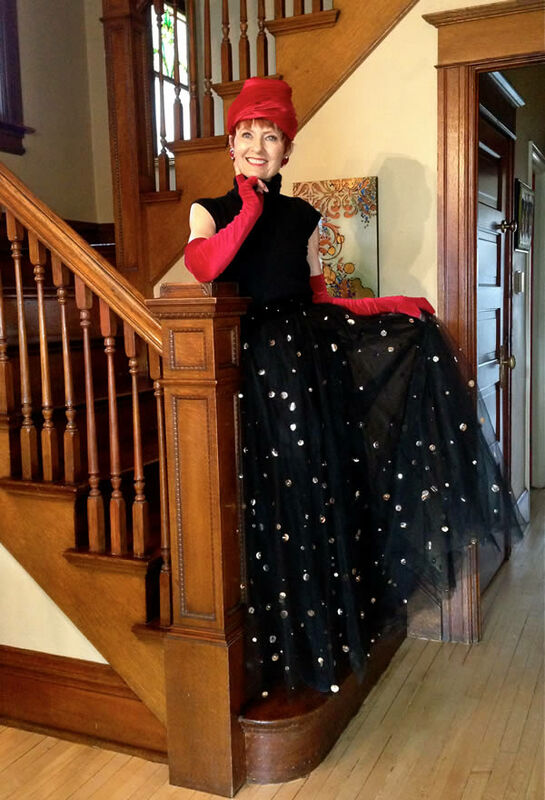 Judith’s blog The Style Crone has been a long-time style crush of mine and is one of my favorite style blogs. Not only does she have exquisite style, she is also a very poetic writer. She is as elegant with her writing as her style and I’m often very moved by her stories of grief and transformation. I know of noone else who wears hats with such style and elegance, nor anyone who looks so young, fresh and modern with vintage clothing. She was also featured in Ari Seth Cohen’s marvellous book Advanced Style. I could go on. In the end though, Judith’s true passion is hats. Today she will reveal some of her style secrets and talk about her passion for both hats and blogging. I’m sure you will be as inspired as I was when I read her answers. Enjoy! Hi Judith. Thanks for taking the time to answer a few questions for 40PlusStyle. Can you tell us a little bit more about yourself? I spent most of my life working in health care as a master’s level psychiatric nurse, mostly in an emergency setting. I found that putting an outfit together set the tone for my day, which included talking with interesting and traumatized people in the midst of crisis. I was always amazed by the strength of the human spirit during difficult and overwhelming circumstances. The stories reside with me to this day. The process of creative self expression became a daily ritual, a form of art, self entertainment, a way to ground myself and it was fun. I turned 70 about a month ago. I’m healthy, which is the most important factor in my life and I spend time maintaining that, knowing that without out it everything becomes more difficult. I know that I can’t control the future in so many ways, including my health, but I have been focusing on how I want to spend my time, knowing that to be alive is a gift. I started my blog in July of 2010. At that time, my husband Nelson had been living with cancer for over five years. I launched Style Crone as a way to cope with a difficult life situation with the full support and encouragement of Nelson. 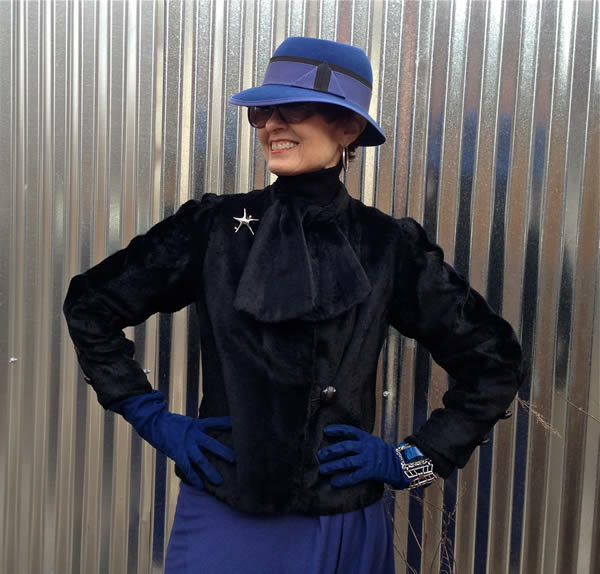 He was my photographer as I posted photos of my outfits and wrote about my ensembles, which always included a hat, and my process as a caregiver. ‘What to Wear to Chemo’ became a regular series. I blogged through Nelson’s death, through grieving and now through what I refer to as my transformation. I also wrote about the process of aging. I was inspired by Ari Seth Cohen’s Advanced Style, which features magnificent older women (and sometimes men) who express themselves through style. I am grateful that Ari started a movement which encourages older people to remain visible, contrary to cultural norms. I also discovered numerous blogs by mostly women of a certain age, which also encouraged me to take the step of publishing my first post. And I never looked back! You call your blog The Style Crone. Why did you choose to call it that? It took time and thought to choose the name for my blog. I became aware that there were no positive terms to describe older women. Mature can be used to describe a woman of any age. I learned that ‘hag’ used to mean ‘holy one.’ I researched the word crone, which for some reason spoke to me. Today it is defined as ‘ugly old woman,’ but in times past it described a woman who was revered, wise and valued in communities. I decided that using this word in a positive way could be a drop in the ocean in the process of changing the perception of aging. Crone has become an endearing term to me. That’s a good question. Perhaps eclectic, but I have difficulty coming up with a label. Most of what I wear is from estate sales, consignment shops, thrift stores and yard sales. I’ve been collecting vintage since the 70’s and my hats have a special room in my home. I love to experiment and play with ideas and concepts, and believe that building an outfit is a form of body collage. What would you define as the main components of your style? 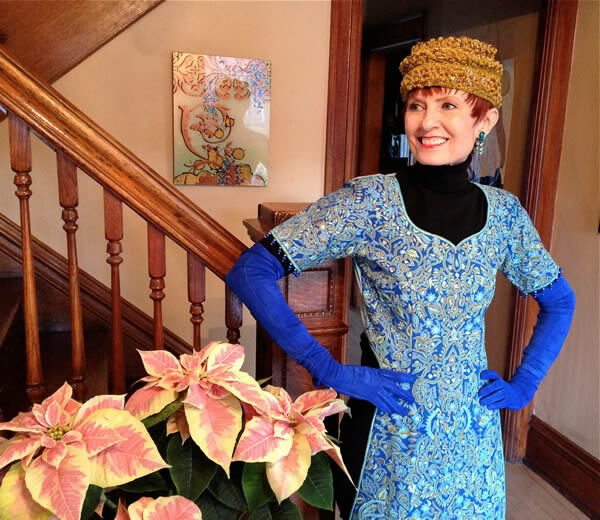 What makes an outfit truly Judith? My hat is usually the main component of my outfit, or at least the starting point. Sometimes I change it up and start with another element, such as the shoes, or a jacket. It could be anything. Then I just go from there. It’s an organic process for me and part of who I am. At times it has a meditative feel and I lose myself in the process. I choose my outfits based on my activities, events and the rhythm of the day. I never leave the house without a hat. I wear a hat to yoga, but it comes off before I enter the studio. If I’m going out to a party or an event, I dress to the nines. However, I’m sensitive to the occasion and dress accordingly, such as for a memorial service, but as a daily practice, I dress for myself. Inspiration is everywhere. Nature, the diversity of people, travel, other bloggers, theatre, architecture, movies, history, books, life experiences, art, music. My outfits are a reflection of my inner self and my life as it unfolds. I dress instinctively. I choose clothing because it speaks to me or attracts me in some way. I love to experiment, repurpose pieces and challenge myself. I don’t use color profiling, but over the years I have developed a sense for what shapes work best for my body type. I use the mirror to tell me if an outfit is pleasing to me. Your style always incorporates a hat. Why is that? I started wearing hats in the 70’s. I had a friend who owned a vintage clothing store, and I began wearing hats everywhere. I worked at a mental health center during that time, and wore hats to work as well. I found acceptance in my work place, so freedom of expression became second nature. I also found hats in consignment stores, estate sales and thrift shops. I was fascinated by how I could change the spirit of any outfit with the addition of a hat. I don’t feel fully dressed or complete without headwear. Why are hats so special to you? Hats are my passion. I don’t know where it came from. My love of hats escalated when I opened a hat shop with a partner who, like me, was a psychiatric nurse. We had no retail or business experience, but miraculously kept the shop open for four years. The experience changed me in many ways. I became drawn to hats created with sumptuous materials and interesting shapes. I also love cocktail hats with their whimsy and mystery. Veils are especially appealing. Every hat has its own personality and the more interesting, the better. Like people! How do you go about choosing the right hat? What are you looking for in a new hat? I just put it on my head and take a look in the mirror. If I love the color, the shape, and it’s out of the ordinary, I have fallen in love all over again. At this point, it has to be very unusual to catch my attention. My hat collection is extensive and I don’t want to bring anything home that doesn’t fascinate or inspire. What is your favorite hat and why? I don’t have a favorite hat. I love them all for their own beauty, personality and statement, and what they add to my life across the continuum. I have a hat room where my hats reside and I arrange mostly by color. The casual hats that I wear for errands and appointments have a special allure, and my evening hats are playful and dramatic. They also contain the memories of my life, which makes it difficult to downsize. How would other women that aspire to wearing more hats get started? I would say to start with something understated, like a beret or fedora. Scanning thrift shops or consignment stores is an inexpensive way to start. Wear the hat for a short period of time at first, such as out to coffee or a walk in the park. 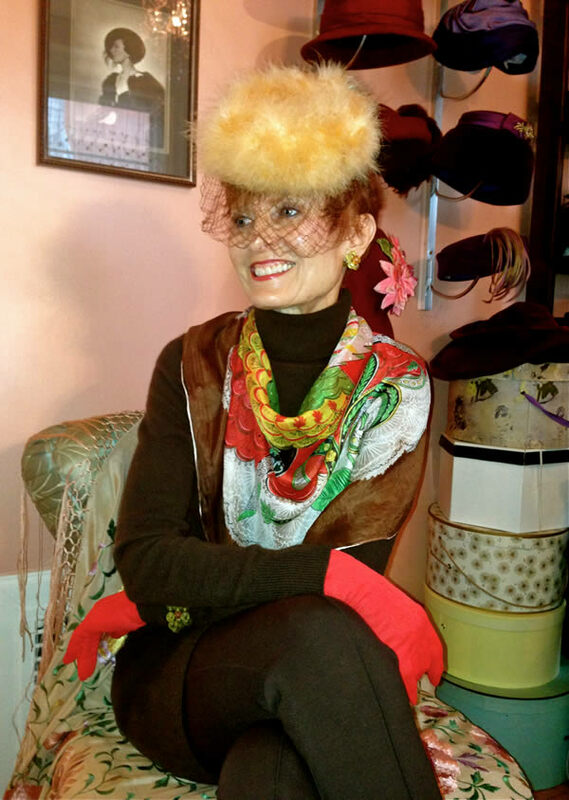 Just like any new behavior, It takes a bit of practice, but you may notice that you get a better seat at a restaurant or someone may say, ‘That’s a great hat!’ Before long, it may become a habit and then you are hooked! I was known to tell customers in the hat shop to ‘just put the hat on your head and walk.’ It’s not a life long commitment, and you can always take it off. I’m all over the map with my self expression, and am willing to try almost anything that interests me. 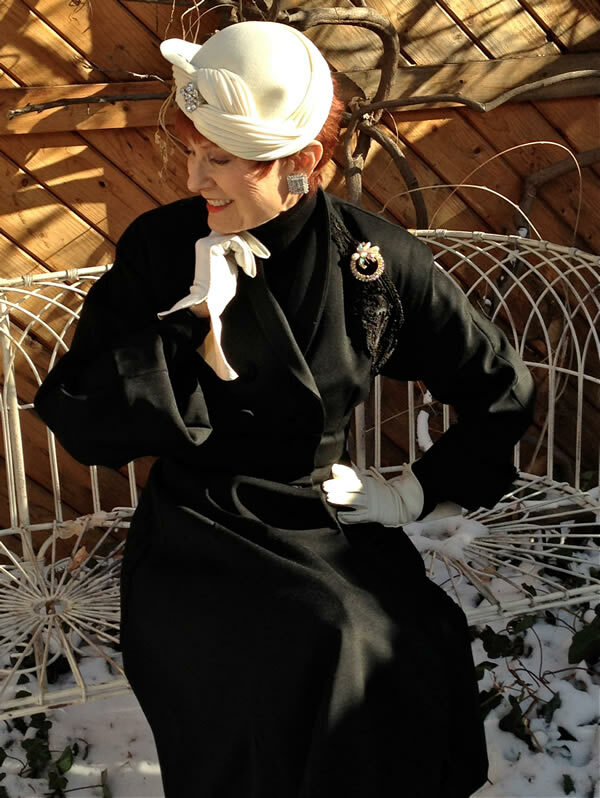 I would say that a hat is my signature, and I enjoy wearing the vintage pieces from my collection in combination with modern items. I am also fascinated by gloves, and have a collection that I have acquired over the years that add a special touch to an outfit. Accessories and details are the excitement of any ensemble. I owned my hat shop in my 40’s, so my style was evolving during that time. Having worked in health care all of my life, it was an exploration and a new experience. That was about 30 years ago, and change is a part of life. I have become more experimental over time and that continues to this day. And I believe I will continue to do so. Growth, change and curiosity have followed me throughout the decades. I dress according to my comfort level and what makes me happy. Self expression and fun are part of the picture. I don’t rely on rules or directives. If a garment or accessory pleases me, that is the criteria that I follow. If the reflection in the mirror makes me smile, out the door I go. I would say that as I age, I have become more focused on my personal style. Part of this is because of my blog. I frequently and playfully put together outfits in my mind. It has helped me live with intention through difficult times and it is now part of the transformation of my life. Putting together an outfit is creative for me and an expression of the internal, a reflection of a space in time. Because it is part of me, I want that expression to be pleasing. I dress for myself and how it makes me feel. I also feel it reflects self respect and is a way that I care for myself. I don’t have a favorite outfit, and if I do, it changes by the time I put another ensemble together. 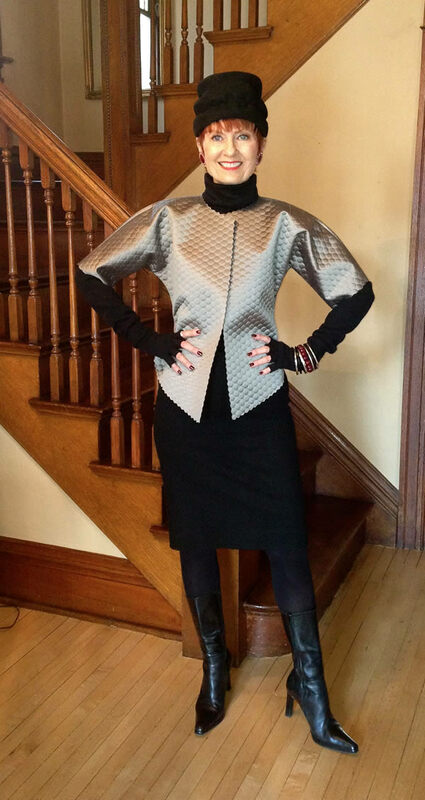 Do you have any style tips for women over 40 that you like to share? Have fun and express yourself. It doesn’t have to be serious and it can add to the pleasure of life. Like eating chocolate or experimenting with a new persona. It’s not life or death and you can always change your outfit if it doesn’t please you. Creativity is life enhancing! Also, the blogs that I follow inspire me and encourage new ideas. The blogging community has much diversity of style, and because I love differences, I am enchanted by the new and interesting images that are available in an instant. I am in awe of what the blogging community has to offer. Even if it isn’t my style, I admire the art in all of its glory. I plan to continue blogging until I wear my last hat. I have a rhythm now that feels comfortable and I try to avoid self pressure. I have found that I could live in the limitless blog world 24/7, as there are always new bloggers that I discover and want to follow. So I’ve had to find balance and peace with the concept that I have other activities in life that are important to me. I have benefitted greatly from the blogging community, which includes you, Sylvia. It has been a huge support and I learn something new almost every day. I have met so many warm and wonderful people and my life has changed because of it. Another gift that blogging has brought to me is that I fell in love with writing as another form of self expression. My blog has been a lifeline during difficult times and has helped me process my grief and my transformation. I can’t imagine not having this community in my life, as it has been an integral part of the intensity of the last almost three years. I am also aware of my mortality at this point. Health and relationships are at the top of my list. I think about how I want to spend my time, what I want to accomplish, what I want my days to look like, how I want to give back. I want to be a part of the movement to change the current perception of aging and contribute to the concept that women have value no matter their age. Also, I have developed a line of headwear for people who have hair loss secondary to medical problems and I want to get that off the ground. I want to travel and experience the diversity of the world. And still have time to smell the roses, while wearing a hat, of course. I have learned that life turns on a dime and the paths that will present themselves are yet unknown. Thank you Sylvia, for the opportunity to express myself with this interview. I’ve enjoyed and admired your blog for a long time now, and I appreciate your warmth, sense of adventure and the information that you share with this vibrant and diverse group of bloggers that I dearly love. Note from Sylvia: I’m sure you agree with me that there were many lessons in this interview. In fact I shared one of her quotes on my Facebook page if you like to share it. Perhaps I will have a chance to meet Judith this year and if not, then I hope her love of travel brings her to my part of the world! For now, be sure to visit her fabulous blog Style Crone! 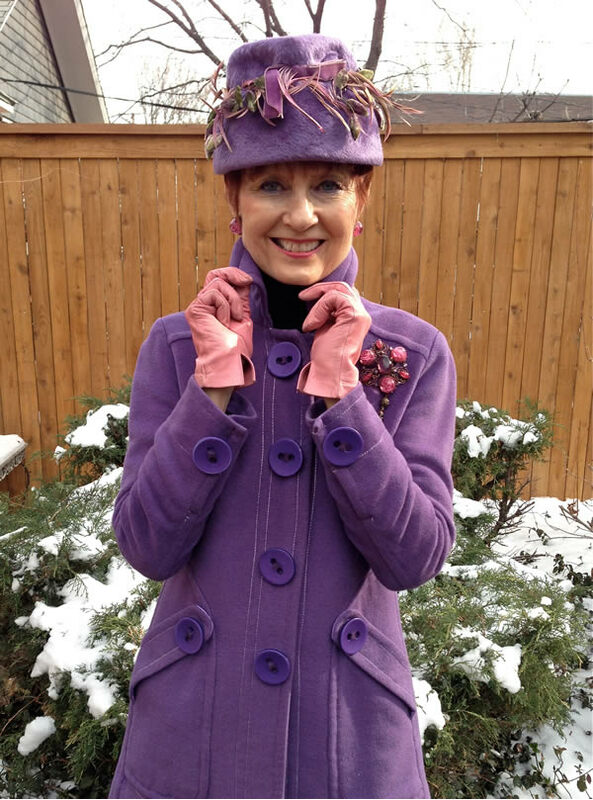 I have visited Judith’s blog several times and find her to be such an amazing woman with a great sense of style. She is such an inspiration and I can’t believe that she’s 70! Thank you, Sylvia, for this enjoyable interview. I think there is a mistake right at the beginning, Sylvia as I simply cannot believe you turned 70, Judith! Creativity, self-expression and style. All that comes to my mind when I look at these photos. 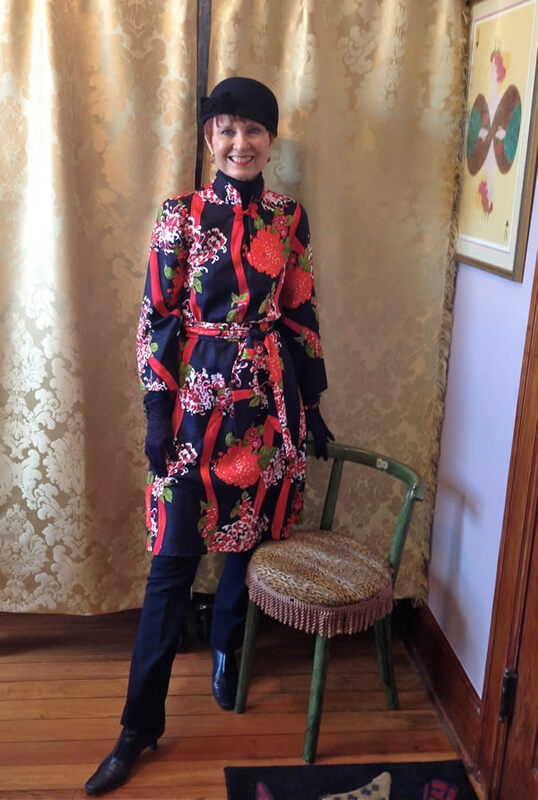 My favourite is the red Paisely coat combined with black. Your figure is awesome, Judith! Also very interesting to learn more about you, your thoughts and your life. Fabulous interview, Sylvia, thank you! 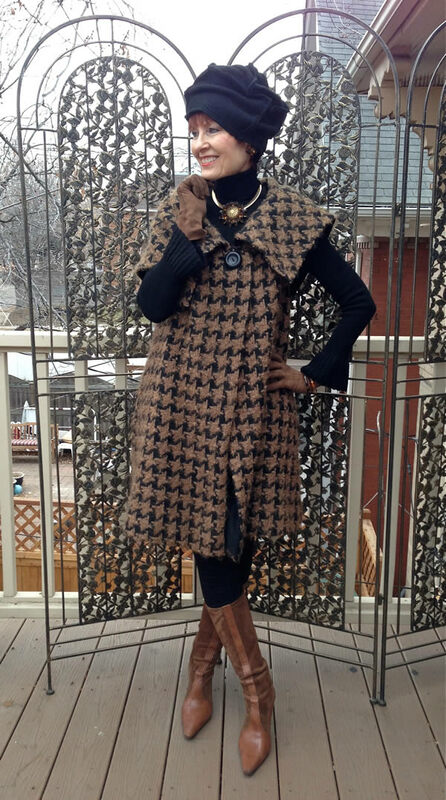 Thank you so much Sylvia, for your kind words and for featuring Style Crone. You are a part of what makes blogging an interesting and dynamic adventure. Sending gratitude! Sylvia, this is my favorite features of yours to date, and you’ve done so many wonderful ones already. Judith is also for me, a style crush. She is inspiring on so many levels. I love her sense of play, her poetry in dress, and her marvelous and positive outlook. And her hats. Mustn’t forget those. Thank you for sharing this gorgeous and elegant woman with us. Wow can’t believe she is 70 she looks so young. I want to look and be stylish when I get to her age which will be a few more years. I may not wear the hats but only because I do not look good in them. She definately knows how to embrass life . Love the article Sylvia. 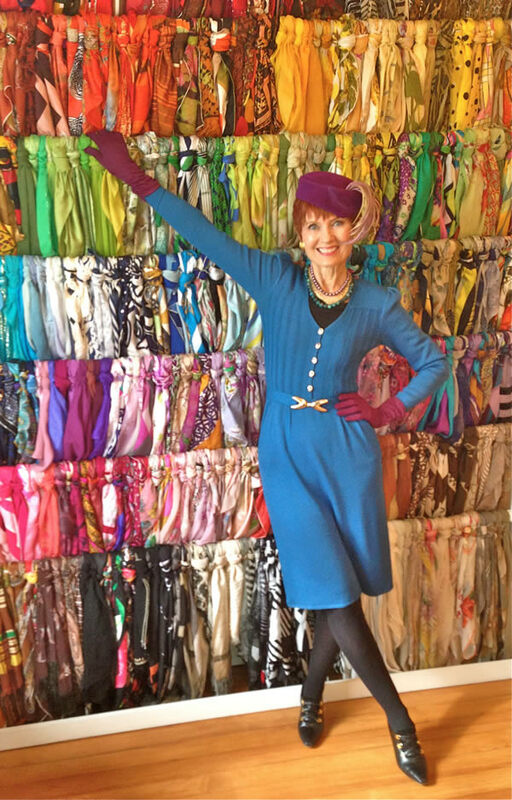 Fabulous interview with the divine Style Crone! Among all of the countless things there are to love about this amazing woman of tremendous wisdom and style and her exquisite blog, I really appreciate the ways Judith and her content have not been co-opted by our culture’s fetishization of youth (such as preoccupation with “looking younger,” concern about “age appropriateness” and all that tiresome business). For this, her blog is a sanctuary, and she is a North Star. Thank you, Sylvia, for featuring Judith! Sylvia, this was truly a treat. 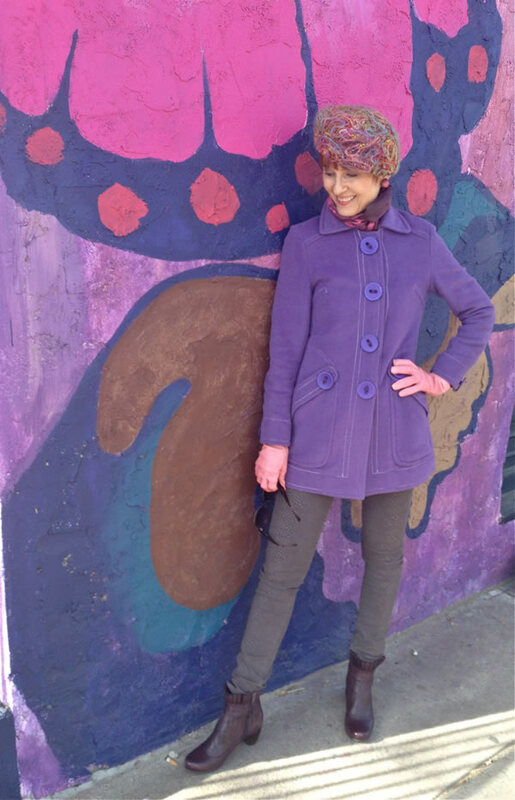 Judith is one of the first blogs I began to follow and have been inspired weekly by her creative energy, love for life, and how she so easily embraces age with such great and unique style. I do need to add, the most remarkable quality I find in Judith is her geniune and beautiful smile, doesn’t it just light up your life? Thank you both for this wonderful interview, it was so much fun to get to know more about this incredible lady. Judith is my heroine. I’m always telling her I want to be just like her when I grow up – if I ever do! She is ageless grace personified, has impeccable taste, and isn’t afraid to wear colorful, gorgeous clothing. I love her hats and sense of style, but most of all I love the heart that she shares with us every week. She truly is beautiful from the inside out, and that’s why I love her. 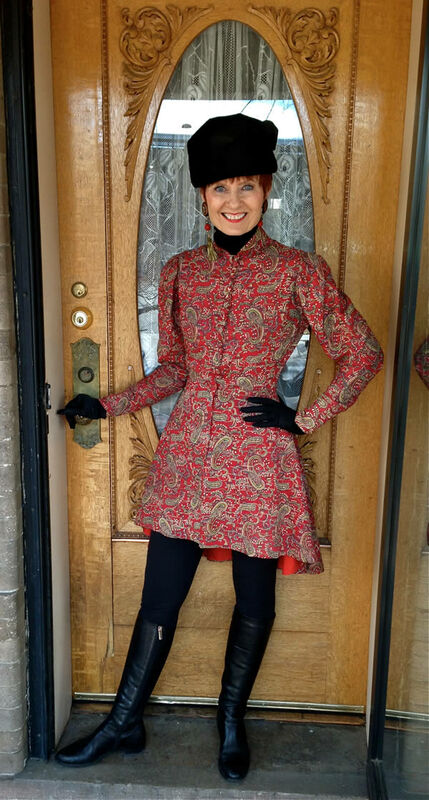 Thank you, Sylvia, for bringing the Style Crone to 40+ Style! Judith is not only beautiful on the outside but also is beautiful on the inside. She has a creative and intuitive style and also has an inspired grace when it comes to wearing hats. I can only hope to be this in tune to my own spirit as I age. She is an example to be treasured. 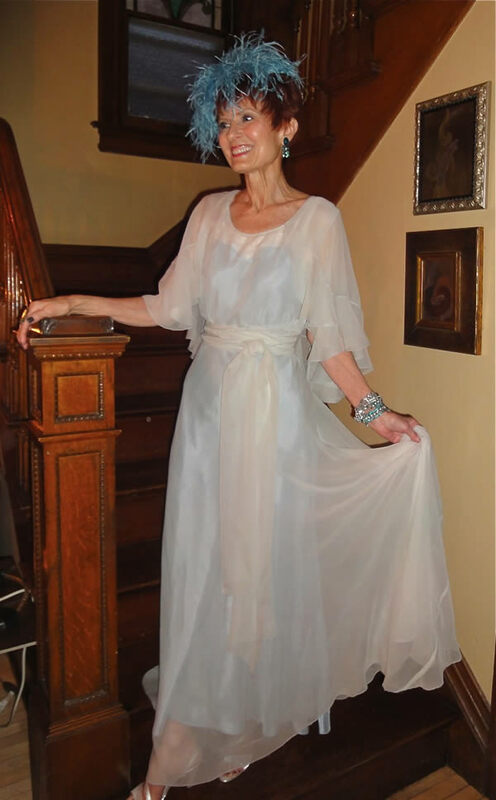 Thank you for such a wonderful interview with Judith Boyd, the Style Crone. I am a huge fan of hers since discovering her blog a few years ago. Her writings and photos never cease to amaze me. Judith is beautiful and radiant and has been an inspiration to me in many ways. I agree with all the women above. Judith is the top. She is so stylish, it is unbelievable. I wish she would be my personal stylist. Gosh, would I look good. Of course she has a tiny figure and a head that was made to wear hats, but it is not as simple as that. She has The Eye. I admire her enormously. Like Trina, I started to follow Judith through your site and she was the first one outside 40plus. Matching all these skills to a lovely personality makes that we all want to follow her. You have featured so many nice outfits of her. The last 5 are my favourite. I cannot narrow it down anymore. She has me gobsmacked so many times. What an incredible, positive, beautiful and smart woman! Sylvia, thanks for the introduction. What a great story and a great lady! Such a wonderful inspiration and proof that style is about attitude. Judith has an absolutely arresting look and spirit and a beautiful writing voice. Hats off to the lady! What an absolute doll. An amazing woman with an inner strength. I inspired by her interview. I can’t wait to see her blog. Thank you. Thanks, Sylvia, for this interview with Judith. She is such a life force and at the same time is unafraid to share her vulnerabilities, which gives everyone who reads her strength. Her style is inimitable and her writing is always riveting. I am always in awe.